TUNE IN: FS1’s film “Davey Lives On” airs July 11 at 6 p.m. ET on FS1. In the summer of 1993, NASCAR superstar Davey Allison agreed to speak to a group of high school students about the dangers of drug use. It was a topic he was passionate about, and he prepared his remarks on lined paper from a spiral notebook small enough to fit in his back pocket. He never delivered the speech. He died on July 13, 1993, days before he was supposed to give it. 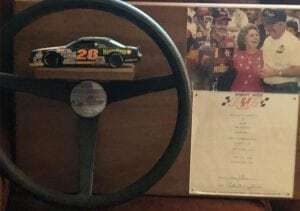 The speech would have been forgotten forever, but as the 25th anniversary of Davey’s death in a helicopter crash at Talladega Superspeedway approached, his widow, Liz Allison, went through a box of his stuff. She found the speech among myriad other items, including his high school yearbook, a report card, racing gloves and baseball mitt. The items unleashed a torrent of emotions for Liz and the two children she and Davey had together, Robbie and Krista. Seeing the speech — remembering his handwriting, knowing that he must have pored over what he would say, imagining him giving it — touched Liz in a way those other items didn’t. 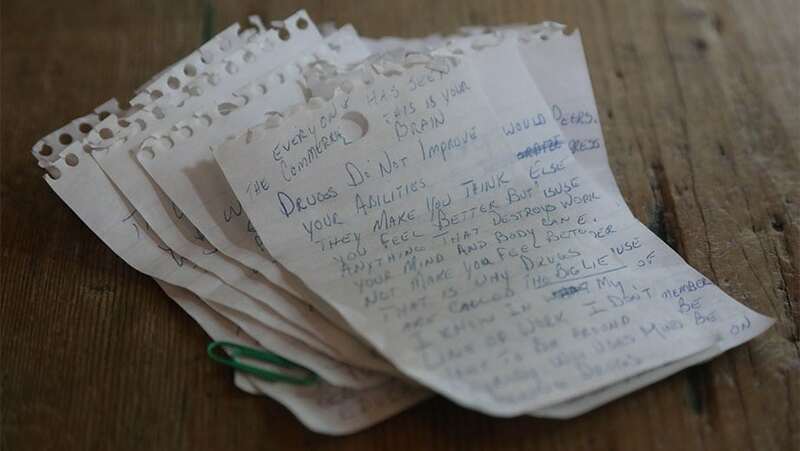 His distinctive handwriting made it intimate, personal, real. “It was a big emotional fallout,” she says. Liz has learned over the years not to hold in her grief, because that just compounds it. If she wants to cry, she cries and gets it over with rather than bottling it up inside. So that’s what she did. And when she was done crying, she kept digging through his stuff. In recent days, she has tweeted pictures of Davey’s NASCAR hard card from 1993, Robbie’s baby “fire suit” that matched his dad’s and a Talladega parking pass — for spot No. 28. Not every item she has pulled from the old boxes drips with deep meaning. Some of them are funny. Davey’s hats, for example. They weren’t stylish then and are even less so now, but he wore them everywhere. As full as those boxes are, what’s not in them is almost as interesting. Davey constantly gave things away, including most of the trophies from his Cup victories. Liz says he gave away a bass boat, a riding lawn mower and a Corvette that he won for getting a hole in one in a golf tournament. Jokes Liz: Davey raced a Ford, so why would he want a Corvette anyway? The friends to whom he gave gifts treasured them at the time and revere them now. They are imbued with memories of specific times in specific places, and to see them, touch them, feel them, takes the owner right back to that specific time and place, simultaneously breaking and warming their hearts. Davey’s grandmother was named Kittie Allison, but everyone called her Mom Allison. Mom Allison traveled widely across the country, as her husband (Edmond, whom everyone called Pop) worked as a pit crew member for their sons, usually Bobby and occasionally Donnie. 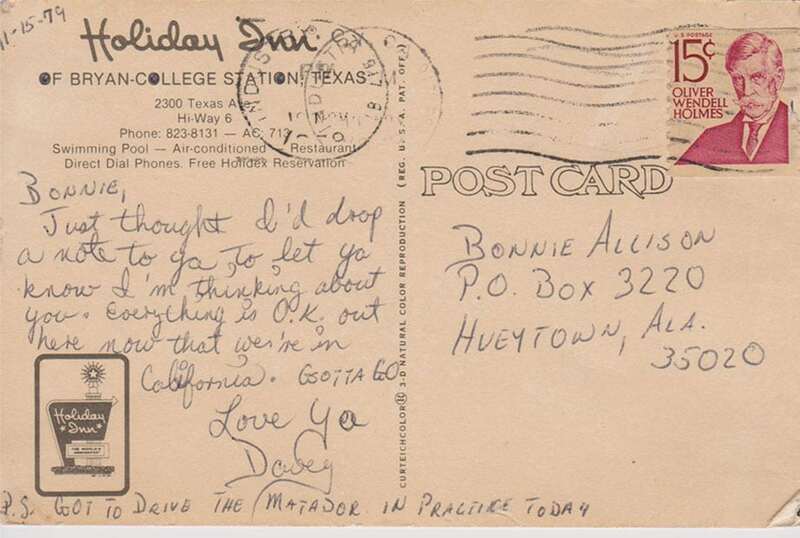 Mom Allison often sent postcards back to Hueytown, Alabama, from whatever hotel they happened to stay in that weekend. Davey’s sister, Bonnie, loved to receive the postcards, and at an early age, 9 or so, she became an avid pen pal, delighting to send and receive mail from friends and relatives across the country, even with a distant cousin in Canada. That’s why she loves a postcard Davey sent her nearly 40 years ago. Davey picked it up at a Holiday Inn in College Station, Texas, but he didn’t send it until he got to California a few days later. He wrote the date on the top — Nov. 15, 1979. His dad finished second in a race in Ontario, California, three days later. Bonnie taped the postcard to the China cabinet in her home in Hueytown — the same home in which she and Davey lived for the bulk of their childhood. It is one of the first things she sees when she walks in her kitchen every day. Davey and crew chief Larry McReynolds were friends before they worked together. 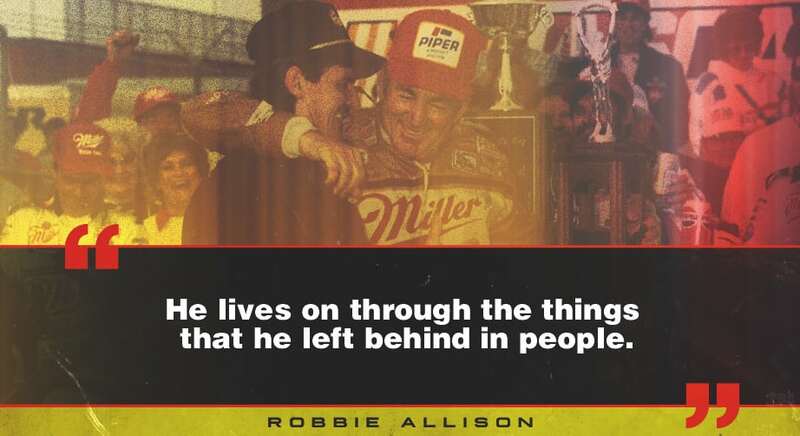 Their haulers seemed to be parked next to each other week after week for years, and they forged a friendship based on conversations about their love of racing, their families and their shared Catholic faith. They discussed working together in the late 1980s, and in fact, McReynolds, now an analyst on FOX Sports, had agreed to take the job as Davey’s crew chief only to back out of it. They remained friends, though, and Davey occasionally would tell McReynolds that if they worked together, they’d win. Finally, early in the 1991 season, both of their circumstances jelled. Davey needed a new crew chief, and McReynolds needed a new driver. When Robert Yates, owner of Robert Yates Racing, offered McReynolds the job — during an hours-long meeting at a Waffle House in Charlotte — he took it. This time, he didn’t back out. The first day they worked together was a test session at Darlington. As McReynolds arrived at the track, he was nervous. He had five-plus years of experience as a crew chief, but none for a top-tier driver. Now he was going to work for the up-and-coming superstar and son of a legend. After the first run, both knew they had something special. McReynolds says he couldn’t wait until lunch so he could find a pay phone to call his wife, Linda, and tell her how great his new job was. Soon the whole NASCAR world knew, too. In their first 10 races, McReynolds and Davey had three wins, five top fives and seven top 10s. In 70 races together, they won 11 times and collected 33 top fives and 41 top 10s. That’s a small sample size, but by percentage those numbers rank among the best driver-crew chief combinations — better than Jimmie Johnson-Chad Knaus, though not as good as Jeff Gordon-Ray Evernham. McReynolds and Davey went to Mass together most Saturday nights before races, became godparents to each other’s children and had them baptized together. McReynolds says if current drivers are looking for a man to emulate, they should choose Davey for how he modeled being a husband, father and racer. 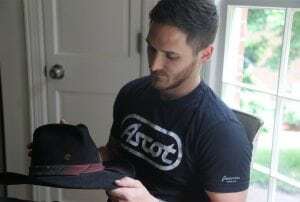 Shortly after Davey died, McReynolds asked team owner Robert Yates if he could have the helmet Davey wore in the final race of his life, at Loudon, New Hampshire, the day before the helicopter crash that killed him. The radio cord still coming out of it, it sits on a shelf to the right of McReynolds’ desk in his home office, where anybody coming in can see it, and ask about it, and thus hear stories about the best friend McReynolds has ever had. As a teenager, Davey worked on his father’s team and spent his off hours building his own race car with his friends. Older racers dubbed them the Peach Fuzz Gang because all of them aspired to grow impressive facial hair but had been unable to do so. It also was a nod to the Alabama Gang, a group of racers from in and around Hueytown, Alabama, of which Bobby Allison was the leader and Davey would eventually become a member. In 1989, Davey went through a divorce from his first wife, and during that time he lived at Tommy’s house. He won the spring race at Talladega that year — the first win in Robert Yates Racing team history. Davey liked winning trophies more than he liked keeping them. He followed his father’s philosophy of racing for the credit and the check. If he had the credit and the check, the trophy became superfluous. He won 19 Cup races, but Liz has only seven trophies. Davey believed that the trophies meant more to other people than they did to him, so he gave many of them away, including that one to Tommy. “I’ve kept it close to my side,” Tommy says. For a while he displayed it at home. Now it sits on the credenza in his office. Gossage looked at the man and said something like, I don’t know who it is, but I sure know who he looks like. 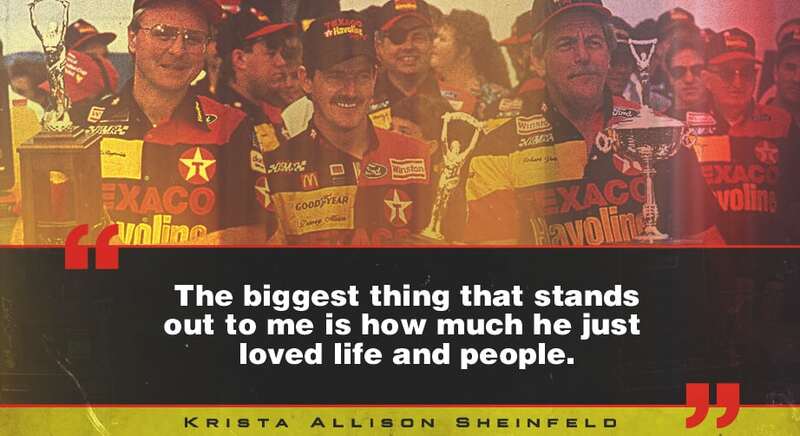 “He looked just like Davey,” said Gossage, the president of Texas Motor Speedway. That was Robbie Allison, whom Gossage hadn’t seen since he was an infant. He was 1 when Davey died, so he doesn’t have any memories of his dad. But he has access to a wealth of information about him, from Liz, Bobby, Tommy, McReynolds and others in the racing community. The stories aren’t all about racing because Davey wasn’t just a racer. He was also a husband and father and brother and friend and hunter and fisherman and golfer. Robbie calls his dad’s old bow one of his most prized possessions. Davey’s golf shoes fit Robbie perfectly. He still uses his dad’s old fishing reel, though he puts it on a newer rod. He uses it when he fishes with Bobby Allison, so three generations of Allisons are represented. “That’s one of those things that I would never let anything happen to it,” he says. Don Leo worked for the agency that ran the Texaco-Havoline program, one of the most iconic in NASCAR history. He knew Davey even before they paired up in that deal, having been introduced years earlier by a mutual friend. Leo’s wife knew Davey even longer. She grew up in Davey’s hometown of Hueytown, Alabama, and was friends with Davey’s cousin. She tells stories of seeing Davey arrive at his cousin’s house on his bicycle. “It” was the steering wheel Davey used to win the 1992 Daytona 500, the biggest win of his career and one of his two favorite racing memories, the other being when he finished second to his father in the 1988 Daytona 500. Leo used to joke with Davey that if he ever wanted to sell the wheel, nobody would know what it was — it looks like any old steering wheel. So, Robert Yates and Davey wrote a letter of authenticity, printed it on Robert Yates Racing letterhead and signed it at the bottom. After Davey died, Leo had the steering wheel, the letter and a No. 28 Texaco-Havoline diecast car mounted, and now it sits in his office. He also has two checkered flags, one from a Davey win in the 1989 summer race at Daytona and another from a 1988 win at Michigan. In 1972, Bobby Allison drove for Junior Johnson, where Robert Yates worked as an engine builder. Allison won 10 races and finished second 12 times that season and finished second in the points race. In 1982, Allison moved to DiGard Racing, where he was reunited with Yates. They won the 1982 Daytona 500 and the 1983 championship. Allison and Yates talked often about Davey, an aspiring driver still years away from debuting in NASCAR. Yates paired up with Davey starting in 1987 in cars owned by Harry Ranier and J.T. Lundy. When Ranier and Lundy wanted to get out of the racing business, they asked Yates, who died of cancer last October, if he wanted to buy the team. From that handshake beginning, Robert Yates Racing grew into a powerhouse NASCAR team. Yates cars won 57 Cup races in 21 seasons, finished in the top five in points 10 times and won the 1999 championship with Dale Jarrett behind the wheel. In 2017, Robert Yates was elected to the NASCAR Hall of Fame. None of that would have happened if not for that conversation with Davey. Doug Yates is reminded of that every day he goes to work, when he walks by one of Davey’s uniforms, a gift he gave to Robert Yates. It’s his iconic Texaco-Havoline fire suit from 1992, when Davey won the Daytona 500, the All-Star Race and took the points lead into the final race before a wreck relegated him to third overall on the season. “That’s really special,” Doug Yates says. Davey was an immensely popular driver who could have signed with whatever team he wanted. “But he always stayed loyal to my dad,” Doug says. 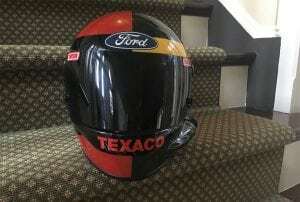 Not everything Davey Allison left behind is, in fact, a thing. Robbie tries to pass along what he’s learned about Davey, to teach his son about the grandfather neither one of them will ever know. Robbie never developed his dad’s obsession with racing. Now he thinks that burning desire to race might have merely skipped a generation. “Since he was 4 months old he’s been picking up toy cars and making little motor noises,” Robbie says of his son. “I don’t even know how you do that at 4 months old, but anything with wheels, he has to grab it. He’s like a little racer, man.